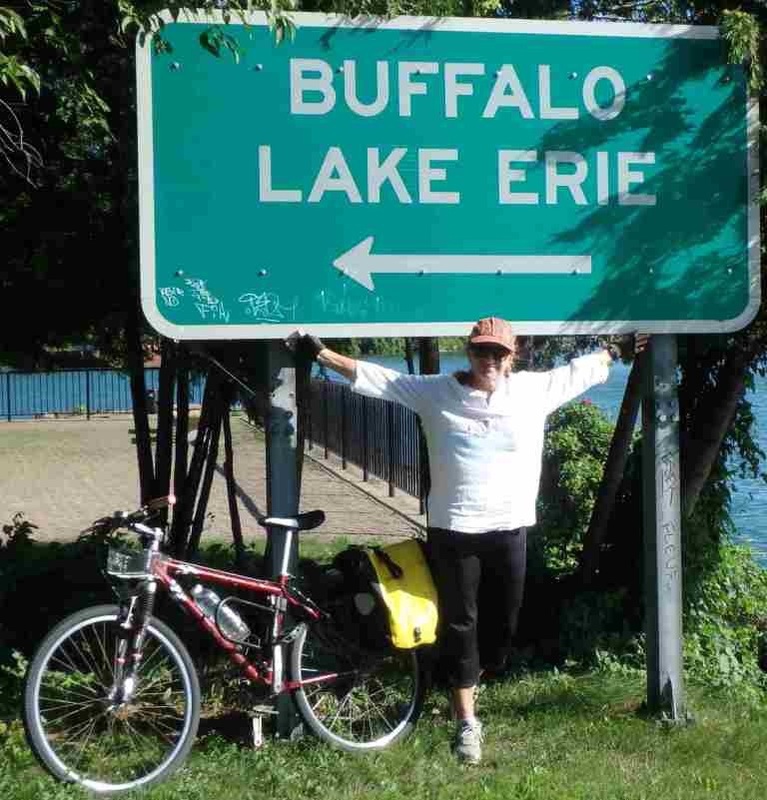 Part 1 of our Great Loop adventure takes us from New York City, along the Erie Canal, on to Buffalo and Niagara Falls. Along the way we pass through 35 locks, rise 570′ in elevation, and meet some interesting characters along the way. For those considering a trip along the Erie Canal, whether you want to continue through the Great Lakes or just spend a couple of months on the canal, either way, I highly recommend it. To get the most out of the trip I also recommend you have a bike! To get you into the mood listen to the Erie Canal song – written in 1905 by Thomas S. Allen. More about the song including lyrics. Once this tune is in your head, you’ll be humming it for sure! Week 1 – New York City and Hudson River. Read more from the New York State Canals website. Read about unstepping our mast in Castleton, Hudson River. This is the first time we unstep the mast on this journey. Watch short Youtube clip about the history of the Erie Canal. Week 2 – Waterford to Little Falls. This trip takes us from the first lock E1 onto Waterford at the intersection of the Mohawk and Hudson Rivers, then up the Waterford Flight to the village of Little Falls at Lock E17. Read more on the New York State Canals. “I was a hoggee on the Erie Canal” – a nine minute look at life as a ‘hoggee’ on the Erie Canal – Youtube. Week 3 – This week we travel from Lock E17 to E24 visiting the towns of Utica, Sylvan’s Beach, Brewerton, and Baldwinsville. We pass through Cross Lake and the Montezuma Wildlife Park. The New York State Canal Corporation’s Cruising Guide to the NYS Canal System is easy to follow and makes a grea souvenir of your trip. Week 4 – This week we shower at the Lyons Fire Station, cycle to Lake Ontario from Spencerport and pass through locks E-27 to E-33. Here begins the straight stretch of canal with many lift-bridges. Bob Stopper – our greeter at Lyons in Wayne County – put together this article from our visit to his lovely town. We are honoured to be the first people to try the bike route! 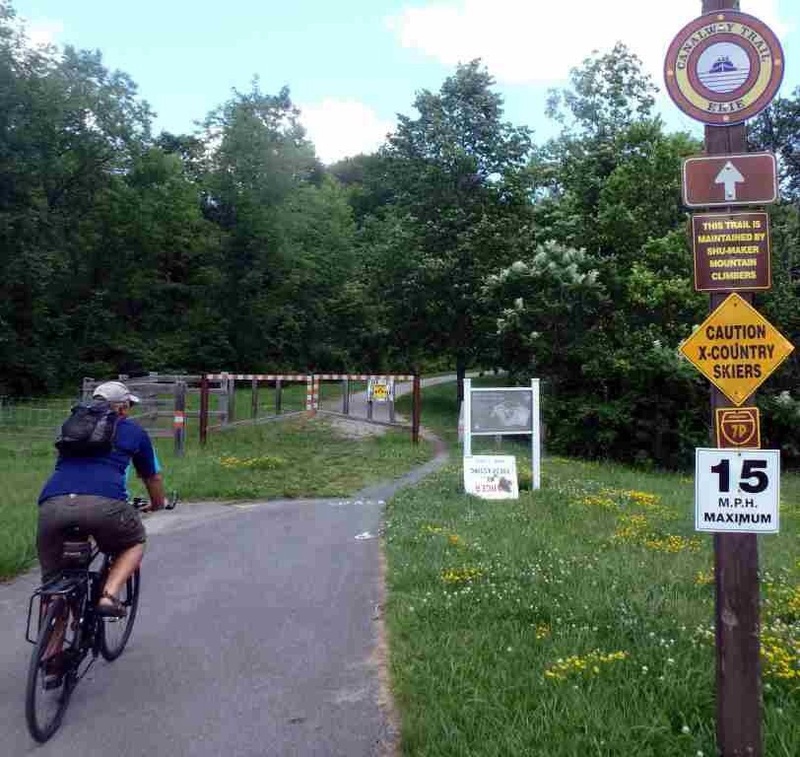 Week 5 – Our final week on the Erie Canal takes us beyond Spencerport to Lockport, the Canal Fest at Tonawanda, and cycle 70kms to and from Niagara Falls. 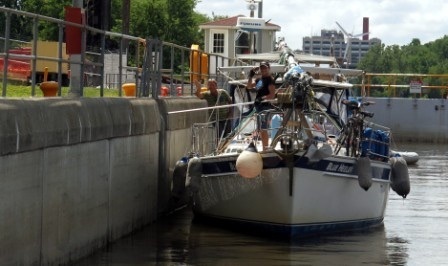 Our mast is restepped at Buffalo and we prepare Blue Heeler for the next stage of our Great Loop adventure! Did you know that the Erie Canal is 300 miles longer than the Panama Canal. But the Grand Canal in China is over 1100 miles long – read more here.